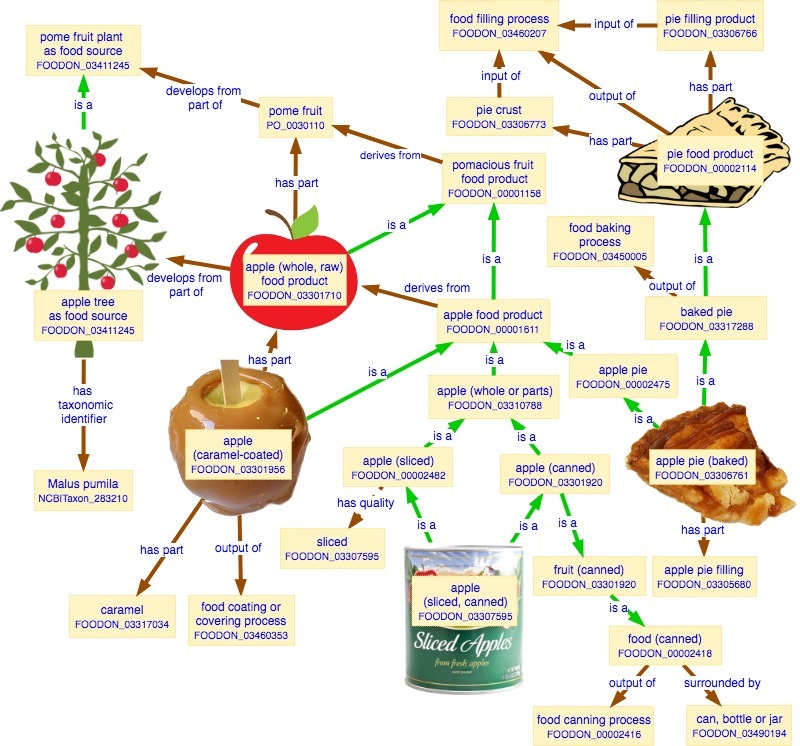 This diagram explores the apple tree food source to food product relationships: three different kinds of apple-related products are shown in relation to a food source organism (apple tree) and various food preparation and packaging processes. The diagram below shows a few other kinds of food product and the various relations that FoodOn currently employs to connect them to raw food source organisms. On the left side an organism has undergone some food transformation process, for example, harvesting, shipping, cooking, freezing, packaging, slicing. On the right side, a reference to an organism does not necessarily involve a food role context. No food transformation processes are implied in organism. For example, “apple tree” with respect to some plant disease does not require us to consider the tree with respect to food products. FoodOn uses the following relations. “has part” is used between entities of the same type, e.g. between anatomical entities, (e.g. “albumen” is part of an egg) or between proscriptive parts (e.g. “a pie has a crust and a filling”). Here a “part” plays a functional role with respect to the whole. It is intrinsic. “has ingredient” is used to refer to a substance added to a food product, which may be transformed such that it is no longer recognizable (e.g. baking soda in muffins). This does raise a question: If an ingredient is visually recognizable are there cases where it could be considered as functionally “part” of the food? “has substance added” was an exploratory object property which can apply to any substance roles – chemical, physical, food, etc. “has ingredient” is a subproperty of “has substance added” pertaining just to a food domain and range. Currently “has ingredient” is not in RO. Use X “member of” Y to associate a food product with a product type category that is outside of the “foodon product type” branch (e.g. EFSA or GS1). 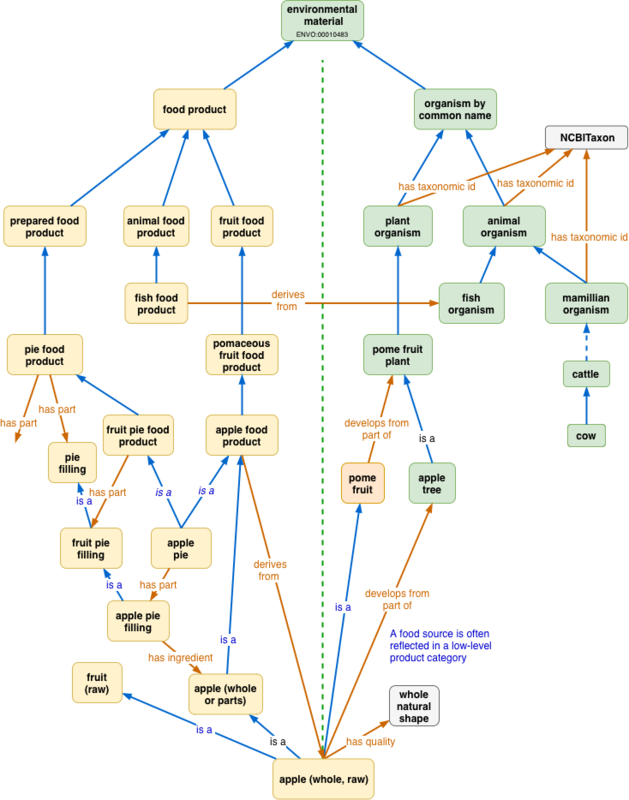 By avoiding “is a” subclass-class axioms between FoodOn food products and agency food categoriation hierarchies, we insulate FoodOn product type logic from any inconsistencies that arise from agency conjunctions or disjunctions of categories. X “develops from part of” Y can be used when X is a cellular structure that undergoes biological growth. In FoodOn, I also have the attitude that it applies to things that can be removed or harvested from X if it does not impact on health or mortality of the organism as a whole. X “derives from” Y (an organism or organism part) is used when no more specific relation is yet available or curated. As well a product X might use only some component of Y.
Y “produced by” X is used when Y is a substance that does not undergo biological growth, like milk. Y may be available in a quantity that can be harvested for food. Includes body products like blood? X “has food substance analog” Y allows two products to be linked when they have similar phenotypic properties or process roles.